Over the past few months, we’ve been experimenting with ways to improve the level of details Arc summaries delivered. Our users have been asking for more information and graphs that described their Google Analytics metrics in a visual way. The hard part was finding a way to increase the amount of information Arc sends to Slack while keeping things written in sentences that were easy to scan. Slack buttons let us create short, scannable summaries that provide helpful details and a graph when expanded. To set up a new clickable summary, log in to Arc and either add a new or edit one of your existing summaries. Once you’ve got your Google Analytics account and Slack channel set up you can choose Interactive Summary from the Shown as drop down. You should now see a preview of the new interactive summary! 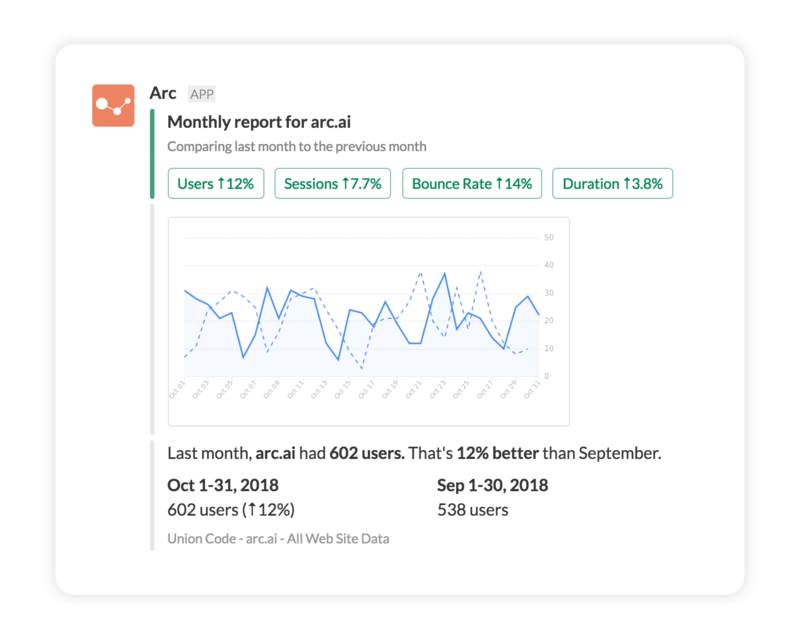 Now, when Arc delivers your Google Analytics to Slack, you can view the basic numbers with the usual red and green color coding to show how your site is performing. If you want more details, you can click a metric to get a detailed comparison and graph showing that metrics recent trend. So that’s how Arc provides extra detail without sacrificing simplicity! Another small change with a big impact 👊.